Last week I attended the Computer-Based Mathematics Education Summit in New York City, run by Wolfram Research and hosted at UNICEF headquarters. Taking a real world problem and expressing it in a mathematical formulation. Mapping the math formulation back to the real world. Wolfram points out that most math classes spend all of their time on step 3, and no time on steps 1, 2, and 4. But step 3 is exactly what computers are good at, and what humans are bad at. And furthermore, steps 1, 2, and 4 are important, and hard, and can only be done by humans (at least for now). So he claims, and I agree, that we should be spending 80% of the time in math classes on steps 1, 2, and 4, and only 20% on computation, which should be done primarily using computers. Our four steps are almost the same, but we use some different language: (1) The globe in the lower left is a physical system you are interested in. You have to make modeling decisions to decide what aspects of the real world can be ignored and which are important to include in the model. (2) The result, in the upper left, is a model, or several models, which you can analyze mathematically or simulate, which gets you to (3) the upper-right corner, a set of results, and finally (4) you have to compare your results with the real world. Prediction: What will this system do in the future? Explanation: Why does the system behave as it does (and in what regime might it behave differently)? Optimization: How can we design this system to behave better (for some definition of "better")? In Modeling and Simulation, students use simulations more than mathematical analysis, so they can choose to study systems more interesting than what you see in freshman physics. And we don't do the modeling for them. They have to make, and justify, decisions about what should be in the model depending on what kind of work it is intended to do. Leaving aside whether we should call this activity math, or modeling, or something else, it's clear that Wolfram's framework and ours are getting at the same set of ideas. So I was looking forward to the summit. I proposed to present a talk called "Six Ways Coding Teaches Math," based on Modeling and Simulation, and also on classes I have developed for Data Science and Bayesian Statistics. For reasons I'm not sure I understand, my proposal was not accepted initially, but on the second day of the conference, I got an email from one of the organizers asking if I could present later that day. Special thanks to John Geddes, who also attended the CBM summit, and who helped me prepare the presentation and facilitate discussions. And thanks to Mark Somerville, who answered a last minute email and sent the figure above, which is much prettier than my old version. Here's an outline of what I talked about. My premise is that programming is a pedagogic wedge. If students can write basic programs in any language, they can use that skill to learn almost anything, especially math. This is also the premise of my book series, which uses Python code to explain statistics, complexity science, and (my current project) digital signal processing. This is probably the most obvious of the six, but students can learn computational mechanisms and algorithms by translating them into code from English, or from math notation, or even from another programming language. Any misunderstandings will be reflected in their code, so when they debug programs, they are also debugging their brains. If you prove a result mathematically, you can check whether it is true by trying out some examples. For example, in my statistics class, we test the Central Limit Theorem by adding up variates from different distributions. Students get insight into why the CLT works, when it does. And we also try examples where the CLT doesn't apply, like adding up Pareto variates. I hope this exercise helps students remember not just the rule but also the exceptions. 3) Understanding math entities by API design. Many mathematical entities are hard to explain because they are so abstract. When you represent these entities as software objects, you define an application program interface (API) that specifies the operations the entities support, and how they interact with other entities. Students can understand what these entities ARE by understanding what they DO. An example from my statistics class is a library I provide that defines object to represent PMFs, CDFs, PDFs, etc. The methods these object provide define, in some sense, what they are. This pedagogic approach needed more explaining than the others, and one participant pointed out that it might require more than just basic programming skills. I agreed, but I would also suggest that students benefit from using these APIs, even if they don't design them. 4) Option to go top down. When students have programming skills, you don't have to present every topic bottom-up. You can go top-down; that is, students can start using new tools before they understand how they work. An example came up when I started working on a new textbook for Digital Signal Processing (DSP). In DSP books, Chapter 1 is usually about complex arithmetic. If you approach the topic mathematically, that's where you have to start. Then it takes 9 chapters and 300 pages to get to the Fast Fourier Transform, which is the most important algorithm in DSP. Approaching the topic computationally, we can use an implementation of FFT (readily available in any language) to start doing spectral analysis on the first day. Students can download sound files, or record their own, and start looking at spectra and spectrograms right away. Once they understand what spectral analysis is, they are motivated and better prepared to understand how it works. And the exercises are infinitely more interesting. 5) Two bites at each apple. Some people like math notation and appreciate how it expresses complex ideas concisely. Other people find that the same ideas expressed in code are easier to read. If you present ideas both ways, everyone gets two chances to understand. If you are a mathematician who doesn't program, you might prefer the first. If you know Python, you probably find the second easier to read. And if you are comfortable with both, you might find it enlightening to see the idea expressed in different ways. 6) Connect to the real world. Finally, with computational tools, students can work on real world problems. In my Data Science class, students aren't limited to data that comes in the right format, or toy examples from a book. They can work with datasets from almost any source. In Data Science, 80% of time spent prepare data, 20% of time spent complain about need for prepare data. So students work with real data and interact with real clients. 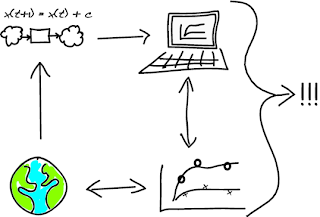 Which reminds me: I am looking for external collaborators to work with students in my Data Science class, starting January 2014. So that was my presentation. Then I had a little fun. I asked the participants to assemble into small groups, introduce themselves to their neighbors, and discuss these prompts: Are there other categories in addition to the six I described? Are the people in the audience doing similar things? How do these ideas apply in secondary education, and primary? After a day and a half of sitting in presentations with limited interaction, many of the participants seemed happy to talk and hear from other participants. Although when you break our active learning methods on a naive audience, not everyone appreciates it! Anyway, I sat in on a some excellent conversations, and then asked the groups to report out. I wish I could summarize their comments, but I have to concentrate to understand and facilitate group discussion, and I usually don't remember it well afterward. One concern that came up more than once is the challenge of building programming skills (which my premise takes for granted) in the first place. There are, of course, two options. You can require programming as a prerequisite or teach it on demand. In the Olin curriculum, there are examples of both. Modeling and Simulation does not require any programming background, and each year about half of the students have no programming experience at all. While they are working on projects, they work on a series of exercises to develop the programming skills they need. And they read "The Cat Book," also known as Physical Modeling in MATLAB. For most of my other classes, Python programming is a prerequisite. Most students meet the requirement by taking our introductory programming class, which uses my book, Think Python. But some of them just read the book. Are there other categories in addition to the six I described? Are you doing similar things? How do these ideas apply in secondary education, and primary? Please comment below or send me email. This past Sunday Wilson Kipsang ran the Berlin Marathon in 2:03:23, shaving 15 seconds off the world record. That means it's time to check in on the world record progression and update my article from two years ago. The following is a revised version of that article, including the new data point. 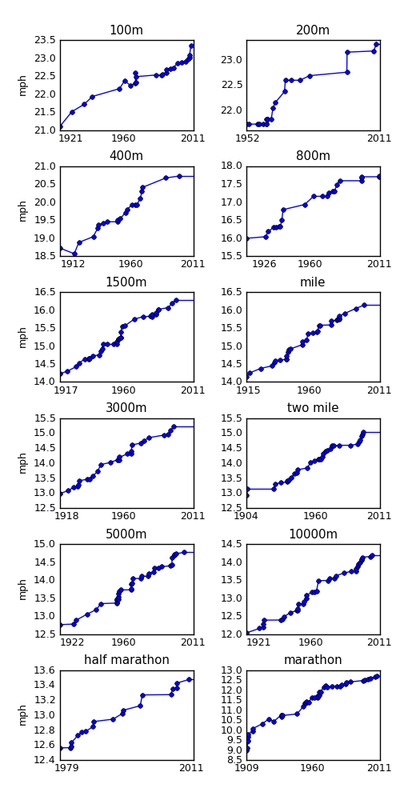 Abstract: I propose a model that explains why world record progressions in running speed are improving linearly, and should continue as long as the population of potential runners grows exponentially. Based on recent marathon world records, I extrapolate that we will break the two-hour barrier in 2043. 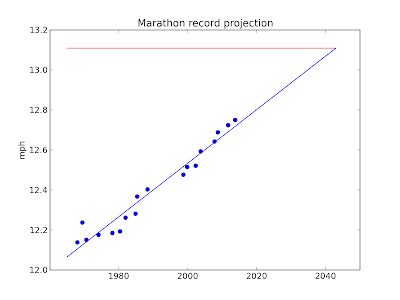 The blue points show the progression of marathon records since 1970, including Wilson Kipsang's new mark. The blue line is a least-squares fit to the data, and the red line is the target pace for a two-hour marathon, 13.1 mph. The blue line hits the target pace in 2043. The red line is the target: 13.1 mph. 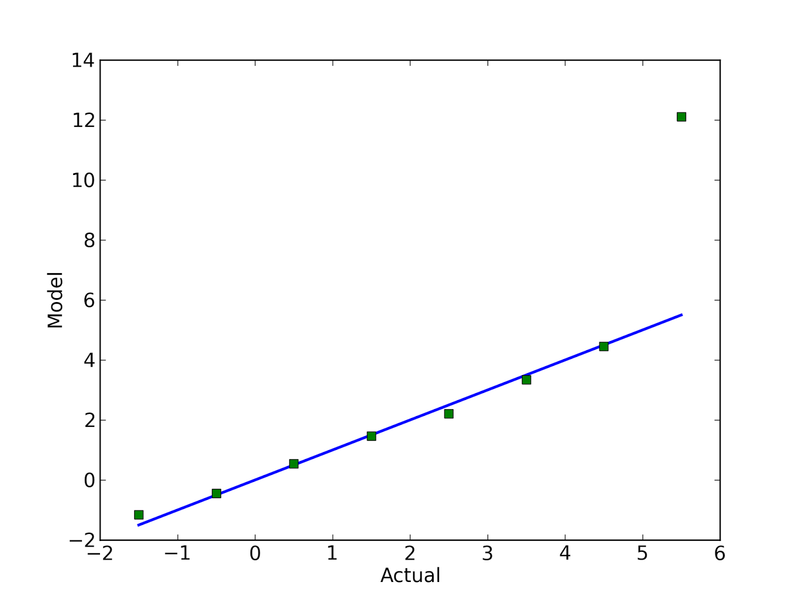 The blue line is a least squares fit to the data. 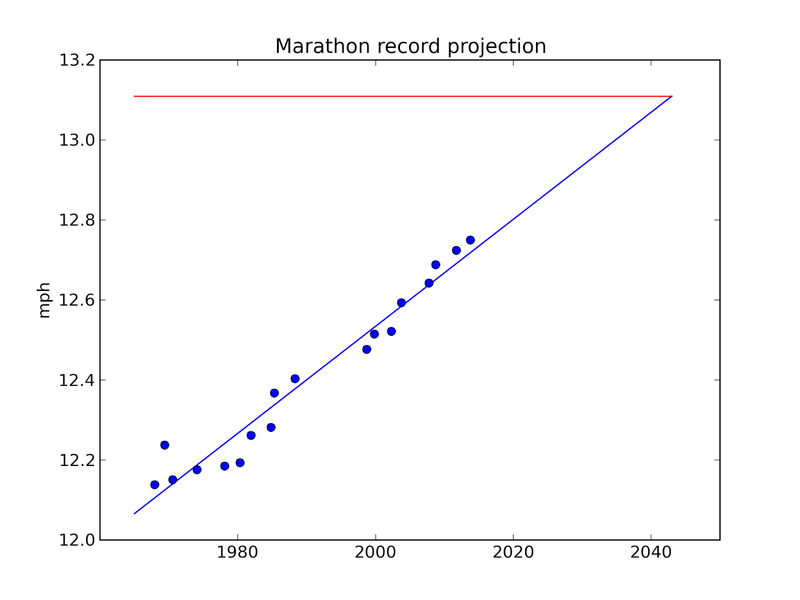 So here's my prediction: there will be a 2-hour marathon in 2043. I'll be 76, so my chances of seeing it are pretty good. But that's a topic for another article (see Chapter 1 of Think Bayes). The subtitle is "How to be a good consumer of statistical analysis." My goal is to present (in about 70 minutes) some basic statistical knowledge a manager should have to work with an analysis team. Part of the talk is about how to interact with the team: I will talk about an exploration process that is collaborative between analysts and managers, and iterative. 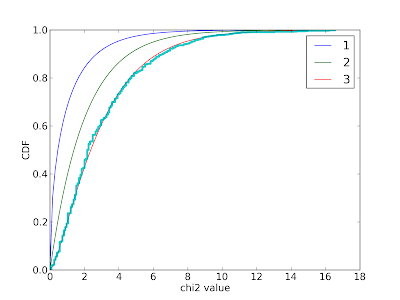 The CDF: the best, and sadly underused, way to visualize distributions. Scatterplots, correlation and regression: how to visualize and quantify relationships between variables. Hypothesis testing: the most abused tool in statistics. 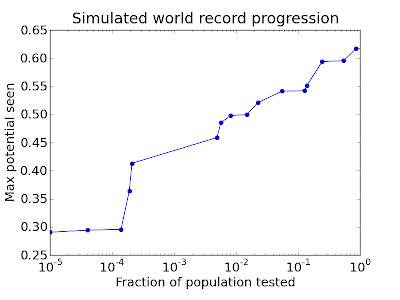 Estimation: quantifying and working with uncertainty. Visualization: how to use the most powerful and versatile data analysis system in the world, human vision. Are your data normal? Hint: no. One of the frequently-asked questions over at the statistics subreddit (reddit.com/r/statistics) is how to test whether a dataset is drawn from a particular distribution, most often the normal distribution. There are standard tests for this sort of thing, many with double-barreled names like Anderson-Darling, Kolmogorov-Smirnov, Shapiro-Wilk, Ryan-Joiner, etc. But these tests are almost never what you really want. When people ask these questions, what they really want to know (most of the time) is whether a particular distribution is a good model for a dataset. And that's not a statistical test; it is a modeling decision. All statistical analysis is based on models, and all models are based on simplifications. Models are only useful if they are simpler than the real world, which means you have to decide which aspects of the real world to include in the model, and which things you can leave out. For example, the normal distribution is a good model for many physical quantities. The distribution of human height is approximately normal (see this previous blog post). But human heights are not normally distributed. For one thing, human heights are bounded within a narrow range, and the normal distribution goes to infinity in both directions. But even ignoring the non-physical tails (which have very low probability anyway), the distribution of human heights deviates in systematic ways from a normal distribution. So if you collect a sample of human heights and ask whether they come from a normal distribution, the answer is no. And if you apply a statistical test, you will eventually (given enough data) reject the hypothesis that the data came from the distribution. Instead of testing whether a dataset is drawn from a distribution, let's ask what I think is the right question: how can you tell whether a distribution is a good model for a dataset? The best approach is to create a visualization that compares the data and the model, and there are several ways to do that. 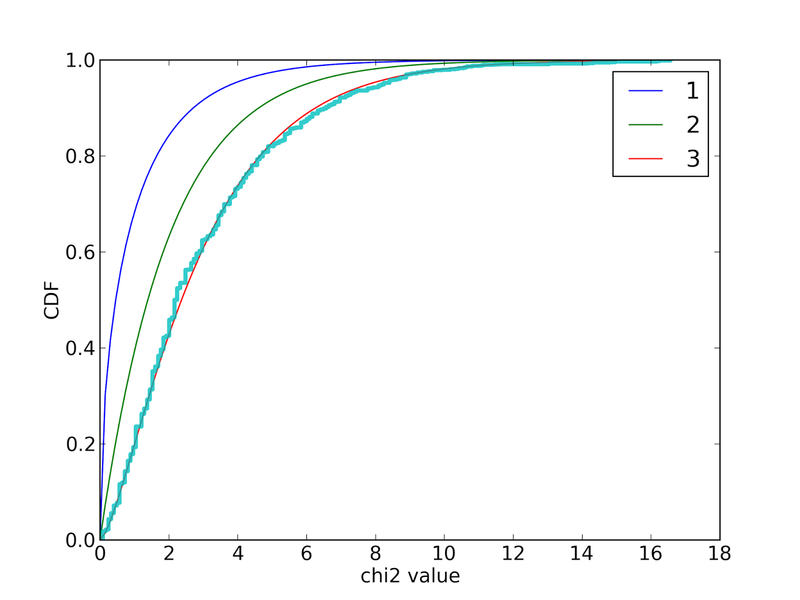 I used this figure to confirm that the data generated by my simulation matches a chi-squared distribution with 3 degrees of freedom. Many people are more familiar with histograms than CDFs, so they sometimes try to compare histograms or PMFs. This is a bad idea. Use CDFs. If you know what family of distributions you want to use as a model, but don't know the parameters, you can use the data to estimate the parameters, and then compare the estimated distribution to the data. 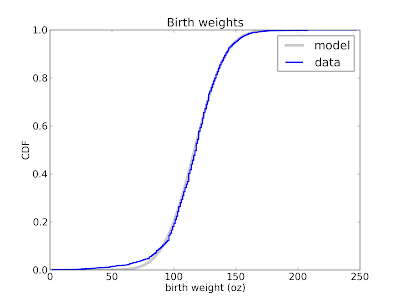 Here's an example from Think Stats that compares the distribution of birth weight (for live births in the U.S.) to a normal model. This figure shows that the normal model is a good match for the data, but there are more light babies than we would expect from a normal distribution. 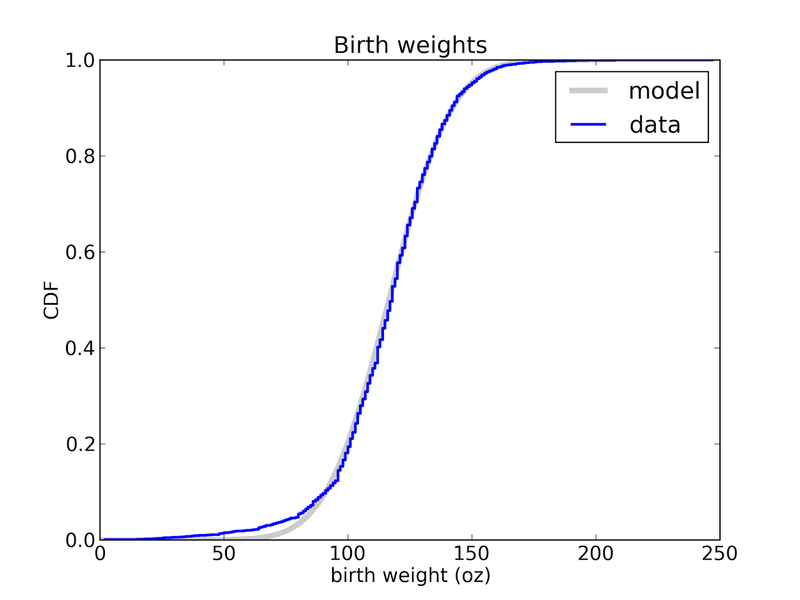 This model is probably good enough for many purposes, but probably not for research on premature babies, which account for the deviation from the normal model. In that case, a better model might be a mixture of two normal distribution. I plotted the x-axis on a log scale because under a log transform a lognormal distribution is a nice symmetric sigmoid where both tails are visible and easy to compare. On a linear scale the left tail is too compressed to see clearly. So that gives a sense of what it looks like when you fit a normal model to lognormal data. """Makes a QQPlot of the values from actual and fitted distributions. cdf and fit are Cdf objects as defined in thinkbayes.py. 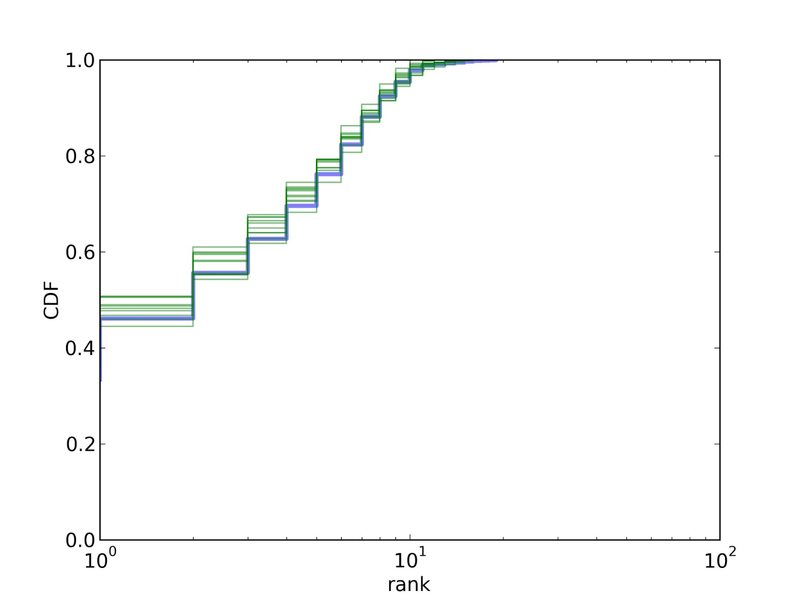 The ps are the percentile ranks from the actual CDF. actual contains the corresponding values from the CDF. 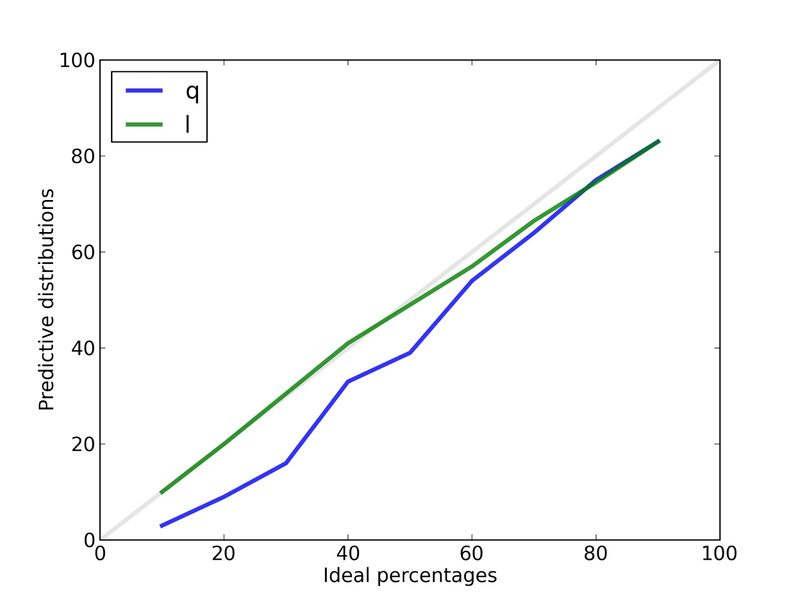 fitted contains values generated by looping through the ps and, for each percentile rank, looking up the corresponding value in the fitted CDF. The resulting plot shows fitted values on the x-axis and actual values on the y-axis. If the model matches the data, the plot should be the identity line (y=x). The blue line is the identity line. Clearly the model a good match for the data, except the last point. In this example, I reversed the axes and put the actual values on the x-axis. It seemed like a good idea at the time, but probably was not. When you compare data to an estimated model, the quality of fit depends on the quality of your estimate. But there are ways to avoid this problem. For some common families of distributions, there are simple mathematical operations that transform the CDF to a straight line. For example, if you plot the complementary CDF of an exponential distribution on a log-y scale, the result is a straight line (see this section of Think Stats). 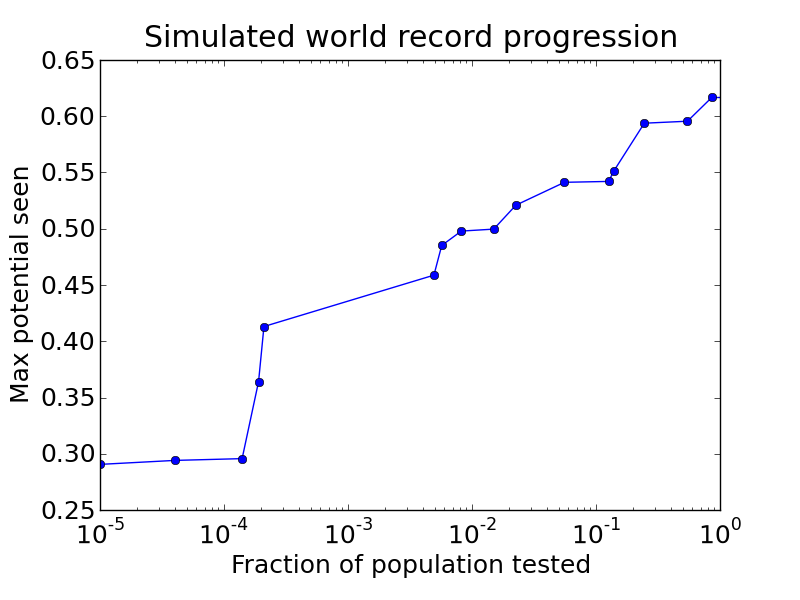 The result is approximately a straight line, so the exponential model is probably a reasonable choice. There are similar transformations for the Weibull and Pareto distributions. Sadly, things are not so easy for the normal distribution. But there is a good alternative: the normal probability plot. 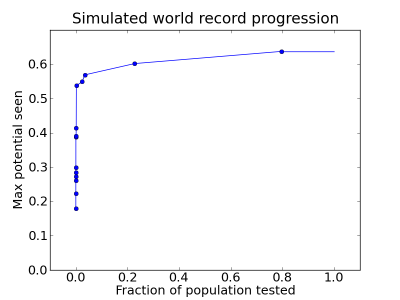 From a normal distribution with µ = 0 and σ = 1, generate a sample with the same size as your dataset and sort it. Sort the values in the dataset. Plot the sorted values from your dataset versus the random values. A normal probability plot is basically a Q-Q plot, so you read it the same way. This figure shows that the data deviate from the model in the range from 1.5 to 2.5 standard deviations below the mean. 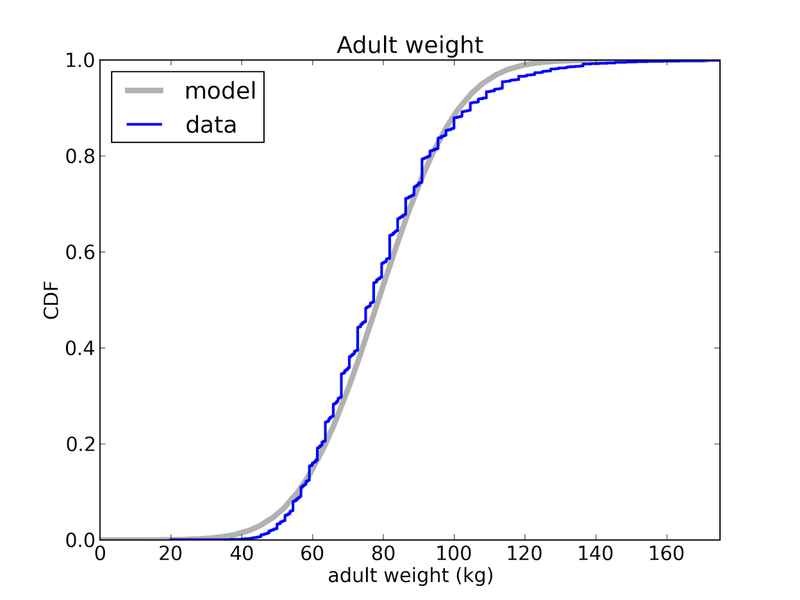 In this range, the actual birth weights are lower than expected according to the model (I should have plotted the model as a straight line; since I didn't, you have to imagine it). There's another example of a probability plot (including a fitted line) in this previous post. 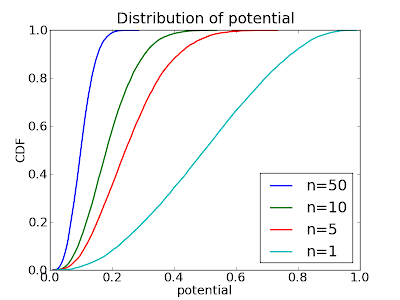 The normal probability plot works because the family of normal distributions is closed under linear transformation, so it also works with other stable distributions (see http://en.wikipedia.org/wiki/Stable_distribution). In summary: choosing an analytic model is not a statistical question; it is a modeling decision. No statistical test that can tell you whether a particular distribution is a good model for your data. In general, modeling decisions are hard, but I think the visualizations in this article are some of the best tools to guide those decisions. I don't understand. Why not go to the next step and perform a Kolmogorov-Smirnov test, etc? Just looking at plots is good but performing the actual test and looking at plots is better. 1) You have a lot of data, so the p-value is low, so you (correctly) conclude that the data did not really come from the analytic distribution. But this doesn't tell you how big the discrepancy is, or whether the analytic model would still be good enough. 2) You don't have enough data, so the p-value is high, and you conclude that there is not enough evidence to reject the null hypothesis. But again, this doesn't tell you whether the model is good enough. It only tells you that you don't have enough data. Neither outcome helps with what I think is the real problem: deciding whether a particular model is good enough for the intended purpose. You can read the rest of the conversation here. Suppose that a radioactive source emits particles toward a Geiger counter at an average rate of r particles per second, but the counter only registers a fraction, f, of the particles that hit it. If f is 10% and the counter registers 15 particles in a one second interval, what is the posterior distribution of n, the actual number of particles that hit the counter, and r, the average rate particles are emitted? This exercise is also inspired by an example in Jaynes, Probability Theory. Suppose you buy mosquito trap that is supposed to reduce the population of mosquitoes near your house. Each week, you empty the trap and count the number of mosquitoes captured. After the first week, you count 30 mosquitoes. After the second week, you count 20 mosquitoes. Estimate the percentage change in the number of mosquitoes in your yard. Suppose that each week a large number of mosquitos, N, is bred in a wetland near your home. During the week, some fraction of them, f1, wander into your yard, and of those some fraction, f2, are caught in the trap. Your solution should take into account your prior belief about how much N is likely to change from one week to the next. You can do that by adding a third level to the hierarchy to model the percent change in N.
The Geiger Counter problem demonstrates the connection between causation and hierarchical modeling. 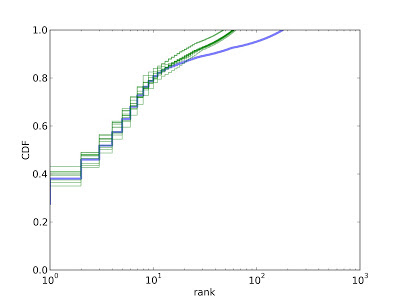 In the example, the emission rate r has a causal effect on the number of particles, n, which has a causal effect on the particle count, k.
The hierarchical model reflects the structure of the system, with causes at the top and effects at the bottom. 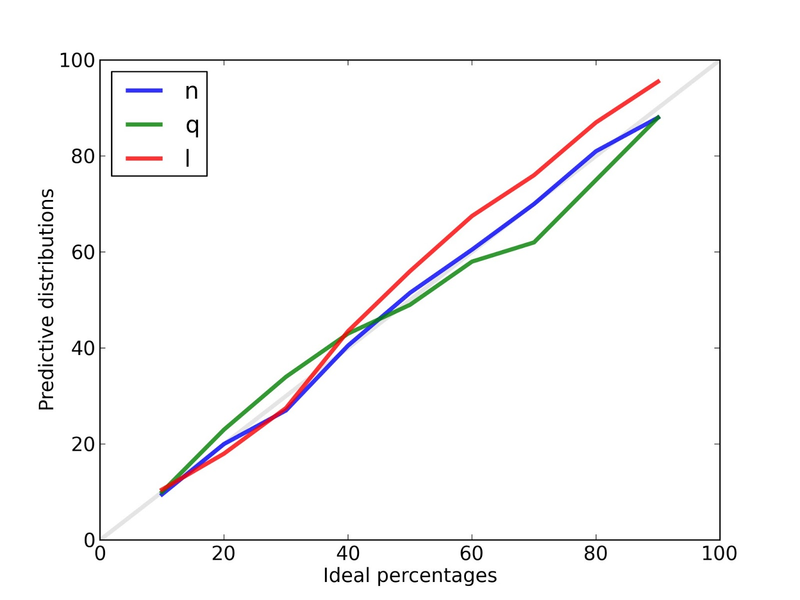 At the top level, we start with a range of hypothetical values for r.
For each value of r, we have a range of values for n, and the prior distribution of n depends on r.
When we update the model, we go bottom-up. 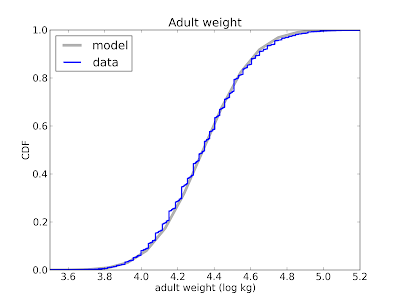 We compute a posterior distribution of n for each value of r, then compute the posterior distribution of r.
So causal information flows down the hierarchy, and inference flows up. Finally, here's Tom's analysis of the same problem. In the previous installment of this saga, I admitted that my predictions had completely failed, and I outlined the debugging process I began. Then the semester happened, so I didn't get to work on it again until last week. Calibrate: Generate fake data from the same model the analysis is based on. Run the analysis on fake data and generate predictive distributions. Check whether the predictive distributions are correct. Validate: Using real data, generate a rarefied sample. Run the analysis on the sample and generate predictive distributions. Check whether the predictive distributions are correct. If the analysis calibrates, but fails to validate, that suggests that there is some difference between the model and reality that is causing a problem. And that turned out to be the case. For the prior I used a Dirichlet distribution with all parameters set to 1. I neglected to consider the "concentration parameter," which represents the prior belief about how uniform or concentrated the prevalences are. As the concentration parameter approaches 0, prevalences tend to be close to 1 or 0; that is, there tends to be one dominant species and many species with small prevalences. As the concentration parameter gets larger, all species tend to have the same prevalence. It turns out that a concentration parameter near 0.1 yields a distribution of prevalences that resembles real data. With a smaller concentration parameter, there are more species with small prevalences, so I had to increase the range of n (the number of species). The prior distribution for n is uniform up to an upper bound, where I choose the upper bound to be big enough to avoid cutting off non-negligible probability. 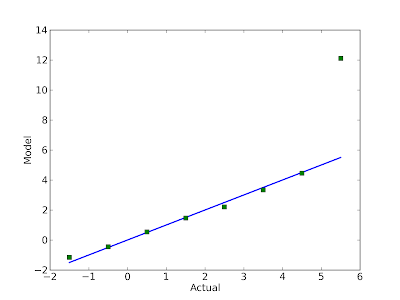 I had to increase this upper bound to 1000, which slows the analysis down a little, but it still takes only a few seconds per subject (on my not-very-fast computer). Up to this point I hadn't discovered any real errors; it was just a matter of choosing appropriate prior distributions, which is ordinary work for Bayesian analysis. But it turns out there were two legitimate errors. Bias due to the definition of "unseen"
I was consistently underestimating the prevalence of unseen species because of a bias that underlies the definition of "unseen." To see the problem, consider a simple scenario where there are two species, A and B, with equal prevalence. If I only collect one sample, I get A or B with equal probability. Suppose I am trying to estimate the prevalence of A. If my sample is A, the posterior marginal distribution for the prevalence of A is Beta(2, 1), which has mean 2/3. If the sample is B, the posterior is Beta(1, 2), which has mean 1/3. So the expected posterior mean is the average of 2/3 and 1/3, which is 1/2. That is the actual prevalence of A, so this analysis is unbiased. But now suppose I am trying to estimate the prevalence of the unseen species. If I draw A, the unseen species is B and the posterior mean is 1/3. If I draw B, the unseen species is A and the posterior mean is 1/3. So either way I believe that the prevalence of the unseen species is 1/3, but it is actually 1/2. Since I did not specify in advance which species is unseen, the result is biased. a) The posterior distribution I generate has the right relative prevalences for the seen species (based on the data) and the right relative prevalences for the unseen species (all the same), but the total prevalence for the unseen species (which I call q) is too low. b) Fortunately, there is only one part of the analysis where this bias is a problem: when I draw a sample from the posterior distribution. 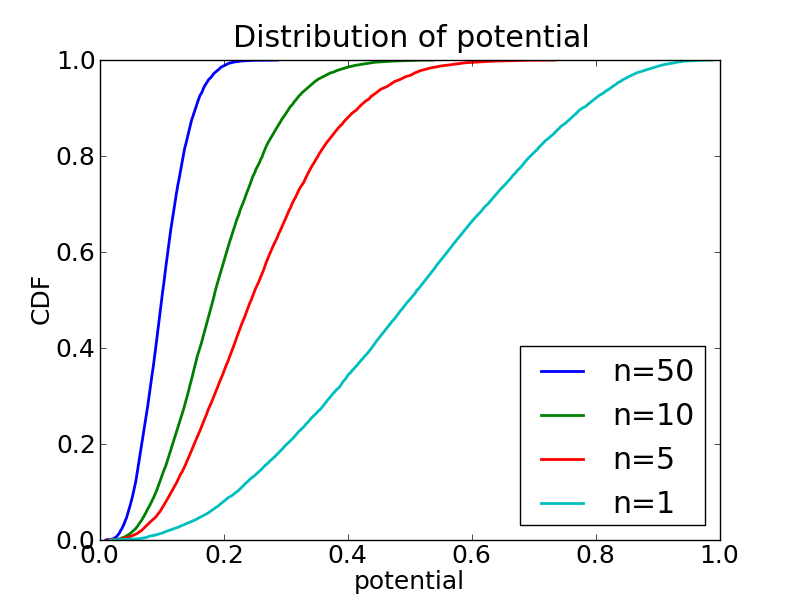 To fix it, I can draw a value of q from the correct posterior distribution (just by running a forward simulation) and then unbias the posterior distribution with the selected value of q.
n is the hypothetical number of species. conc is the concentration parameter. RandomQ creates a Dirichlet distribution, draws a set of prevalences from it, then draws a simulated sample with the appropriate number of reads, and adds up the total prevalence of the species that don't appear in the sample. n is the hypothetical number of species; m is the number seen in the actual data. x is the total prevalence of the seen species; y is the total prevalence of the unseen species. f and g are the factors we have to multiply by so that the corrected prevalence of unseen species is q_desired. After fixing this error, I find that the analysis calibrates nicely. From each predictive distribution I generate credible intervals with ideal percentages 10, 20, ... 90, and then count how often the actual value falls in each interval. For example, the blue line is the calibration curve for n, the number of species. 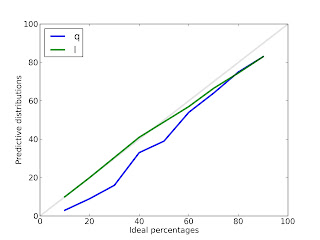 After 100 runs, the 10% credible interval contains the actual value 9.5% of of the time.The 50% credible interval contains the actual value 51.5% of the time. And the 90% credible interval contains the actual value 88% of the time. These results show that the posterior distribution for n is, in fact, the posterior distribution for n.
The results are similar for q, the prevalence of unseen species, and l, the predicted number of new species seen after additional sampling. To check whether the analysis validates, I used the dataset collected by the Belly Button Biodiversity project. For each subject with more than 400 reads, I chose a random subset of 100 reads, ran the analysis, and checked the predictive distributions for q and n. I can't check the predictive distribution of n, because I don't know the actual value. a) Use the data to estimate the parameters of the model. b) Generate fake samples from the model. c) Compare the fake samples to the real data. 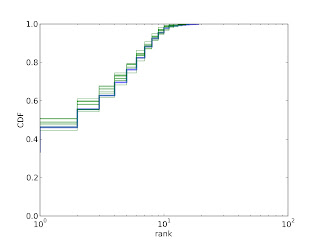 The blue line is the CDF of prevalences, in order by rank. The top-ranked species makes up about 27% of the sample. The top 10 species make up about 75%, and the top 100 species make up about 90%. The green lines show CDFs from 10 fake samples. The model is a good match for the data for the first 10-20 species, but then it deviates substantially. The prevalence of rare species is higher in the data than in the model. The problem is that the real data seem to come from a mixture of two distributions, one for dominant species and one for rare species. Among the dominant species the concentration parameter is near 0.1. For the rare species, it is much higher; that is, the rare species all have about the same prevalence. There are two possible explanations: this effect might be real or it might be an artifact of errors in identifying reads. If it's real, I would have to extend my model to account for it. If it is due to errors, it might be possible to clean the data. I have heard from biologists that when a large sample yields only a single read of a particular species, that read is likely to be in error; that is, the identified species might not actually be present. 1) If a species appears only once after r reads, the probability that the read is bogus is p = (1 - alpha/r), where alpha is a parameter. 2) If a species appears k times after n reads, the probability that all k reads are bogus is p^k. To clean the data, I compute the probability that each observed species is bogus, and then delete it with the computed probability. With cleaned data (alpha=50), the model fits very nicely. And since the model fits, and the analysis calibrates, we expect the analysis to validate. And it does. 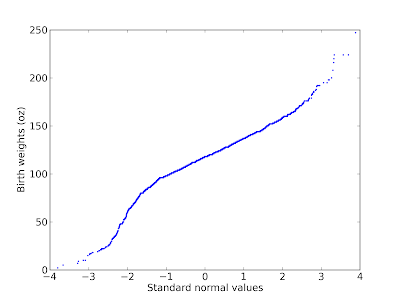 For n there is no validation curve because we don't know the actual values. 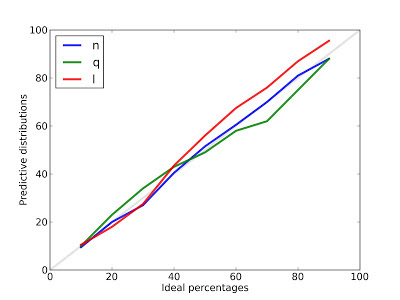 For q the validation curve is a little off because we only have a lower bound for the prevalence of unseen species, so the actual values used for validation are too high. 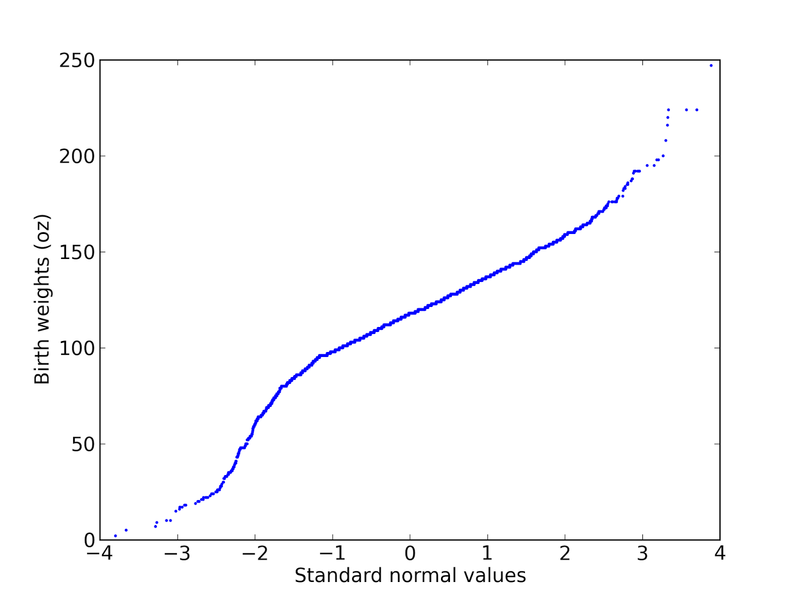 But for l the validation curve is quite good, and that's what we are actually trying to predict, after all. At this point the analysis depends on two free parameters, the concentration parameter and the cleaning parameter, alpha, which controls how much of the data gets discarded as erroneous. So the next step is to check whether these parameters cross-validate. That is, if we tune the parameters based on a training set, how well do those values do on a test set? Another next step is to improve the error model. I chose something very simple, and it does a nice job of getting the data to conform to the analysis model, but it is not well motivated. If I can get more information about where the errors are coming from, I could take a Bayesian approach (what else?) and compute the probability that each datum is legit or bogus. Or if the data are legit and the prevalences are drawn from a mixture of Dirichlet distributions with different concentrations, I will have to extend the analysis accordingly. 1) The prior distribution of prevalences had the wrong concentration parameter. 2) The prior distribution of n was too narrow. 3) I neglected an implicit bias due to the definition of "unseen species." 4) The data deviate from the model the analysis is based on. If we "clean" the data, it fits the model and the analysis validates, but the cleaning process is a bit of a hack. I was able to solve these problems, but I had to introduce two free parameters, so my algorithm is not as versatile as I hoped. However, it seems like it should be possible to choose these parameters automatically, which would be an improvement. And now I have to stop, incorporate these corrections into Think Bayes, and then finish the manuscript! This weekend I gave a talk entitled "Python Epistemology" for PyCon Taiwan 2013. I would have loved to be in Taipei for the talk, but sadly I was in an empty room in front of a teleconference screen. As I explained, the title is more grandiose than accurate. In general, epistemology is the theory of knowledge: how we know what we think we know, etc. This talk is mostly about what Python has taught me about programming, and how programming in Python has changed the way I learn and the way I think. Programming is not about translating a well-known solution into code, it is about discovering solutions by writing code, and then creating the language to express them. This is a nice solution because it is concise and demonstrably correct, but I suggested that one limitation is that it does not extend easily to handle "The Scrabble Problem": given a set of tiles, check to see whether you can spell a given word. """A set with repeated elements.""" "... you don't just write your program down toward the language, you also build the language up toward your program. "In the end your program will look as if the language had been designed for it. And ... you end up with code which is clear, small, and efficient." Paul Graham, "Programming Bottom Up," 1993. In the second half of the talk, I suggested that Python and other modern programming languages provide a new approach to solving problems. Traditionally, we tend to think and explore using natural language, do analysis and solve problems using mathematical notation, and then translate solutions from math notation into programming languages. In some sense, we are always doing two translations, from natural language to math and from math to a computer program. With the previous generation of programming languages, this process was probably necessary (for reasons I explained), but I claim that it is less necessary now, and that it might be possible and advantageous to skip the intermediate mathematics and do analysis and problem-solving directly in programming languages. After the talk, I got two interesting questions by email. Yung-Cheng Lin suggested that although programming languages are more precise than natural language, they might not be sufficiently precise to replace mathematical notation, and he asked if I think that using programming to teach mathematical concepts might cause misunderstandings for students. I understand what you mean when you say that programming languages are less rigorous that mathematical notation. I think many people have the same impression, but I wonder if it is a real difference or a bias we have. I would argue that programming languages and math notation are similar in the sense that they are both formal languages designed by people to express particular ideas concisely and precisely. There are some kinds of work that are easier to do in math notation, like algebraic manipulation, but other kinds of work that are easier in programming languages, like specifying computations, especially computations with state. You asked if there is a danger that students might misunderstand mathematical ideas if they come to them through programming, rather than mathematical instruction. I'm sure it's possible, but I don't think the danger is specific to the programming approach. And on the other side, I think a computational approach to mathematical topics creates opportunities for deeper understanding by running experiments, and (as I said in the talk) by getting your ideas out of your head and into a program so that, by debugging the program, you are also debugging your own understanding. When we do algorithms or pseudocodes in the traditional way, we used to figure out the time complexity at the same time. 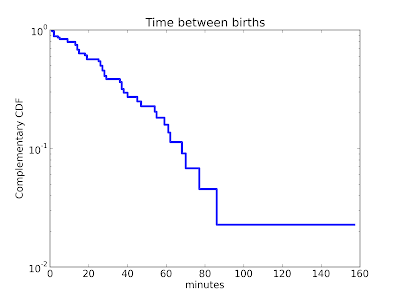 But the Python examples you showed us, it seems not so easy to learn the time complexity in the first place. 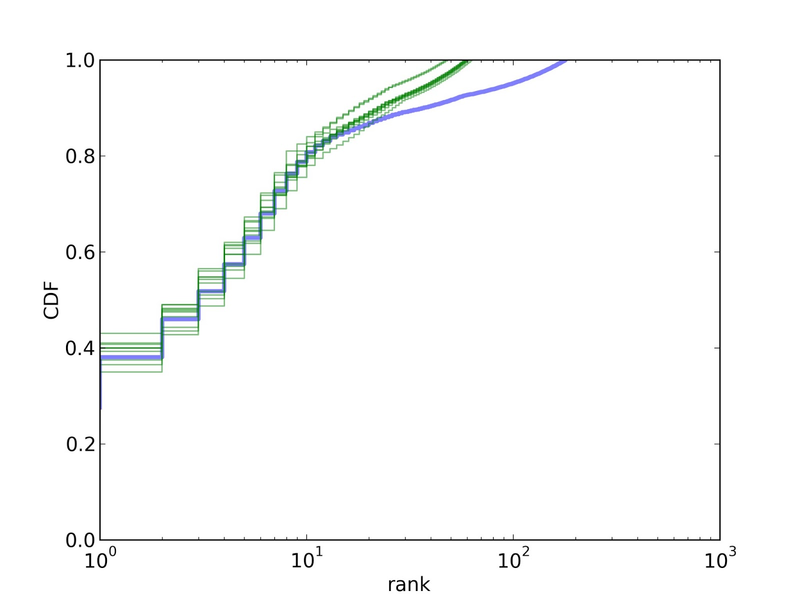 So, does it mean that when we think Python, we don't really care about the time complexity that much? You are right that it can be more difficult to analyze a Python program; you have to know a lot about how the Python data structures are implemented. And there are some gotchas; for example, it takes constant time to add elements to the end of a list, but linear time to add elements in the beginning or the middle. It would be better if Python made these performance characteristics part of the interface, but they are not. In fact, some implementations have changed over time; for example, the += operator on lists used to create a new list. Now it is equivalent to append. Thanks to both of my correspondents for these questions (and for permission to quote them). And thanks to the organizers of PyCon Taiwan, especially Albert Chun-Chieh Huang, for inviting me to speak. I really enjoyed it. I've just added a new chapter to Think Bayes; it is a case study based on a class project two of my students worked on this semester. It presents "The Red Line Problem," which is the problem of predicting the time until the next train arrives, based on the number of passengers on the platform. In Boston, the Red Line is a subway that runs north-south from Cambridge to Boston. When I was working in Cambridge I took the Red Line from Kendall Square to South Station and caught the commuter rail to Needham. During rush hour Red Line trains run every 7--8 minutes, on average. When I arrived at the station, I could estimate the time until the next train based on the number of passengers on the platform. If there were only a few people, I inferred that I just missed a train and expected to wait about 7 minutes. If there were more passengers, I expected the train to arrive sooner. But if there were a large number of passengers, I suspected that trains were not running on schedule, so I would go back to the street level and get a taxi. 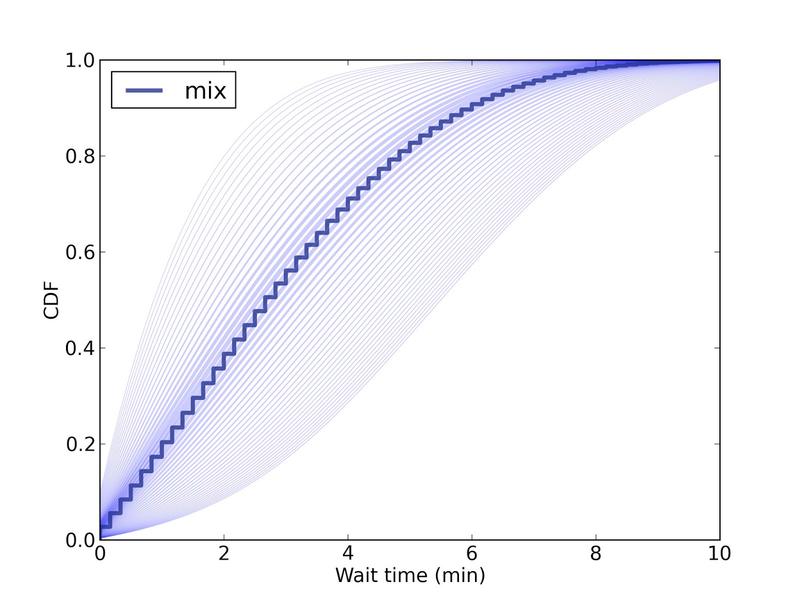 While I was waiting for trains, I thought about how Bayesian estimation could help predict my wait time and decide when I should give up and take a taxi. This chapter presents the analysis I came up with. Sadly, this problem has been overtaken by history: the Red Line now provides real-time estimates for the arrival of the next train. But I think the analysis is interesting, and still applies for subway systems that don't provide estimates. As it turns out, the average time between trains, as seen by a random passenger, is substantially higher than the true average. Why? Because a passenger is more like to arrive during a large interval than a small one. Consider a simple example: suppose that the time between trains is either 5 minutes or 10 minutes with equal probability. In that case the average time between trains is 7.5 minutes. But a passenger is more likely to arrive during a 10 minute gap than a 5 minute gap; in fact, twice as likely. If we surveyed arriving passengers, we would find that 2/3 of them arrived during a 10 minute gap, and only 1/3 during a 5 minute gap. So the average time between trains, as seen by an arriving passenger, is 8.33 minutes. This kind of observer bias appears in many contexts. Students think that classes are bigger than they are, because more of them are in the big classes. Airline passengers think that planes are fuller than they are, because more of them are on full flights. In each case, values from the actual distribution are oversampled in proportion to their value. In the Red Line example, a gap that is twice as big is twice as likely to be observed. The data for the Red Line are close to this example. The actual time between trains is 7.6 minutes (based on 45 trains that arrived at Kendall square between 4pm and 6pm so far this week). The average gap as seen by random passengers is 8.3 minutes. Interestingly, the Red Line schedule reports that trains run every 9 minutes during peak times. This is close to the average seen by passengers, but higher than the true average. I wonder if they are deliberately reporting the mean as seen by passengers in order to forestall complaints. This figure shows the predictive distribution of wait times if you arrive and find 15 passengers on the platform. Since we don't know the passenger arrival rate, we have to estimate it. 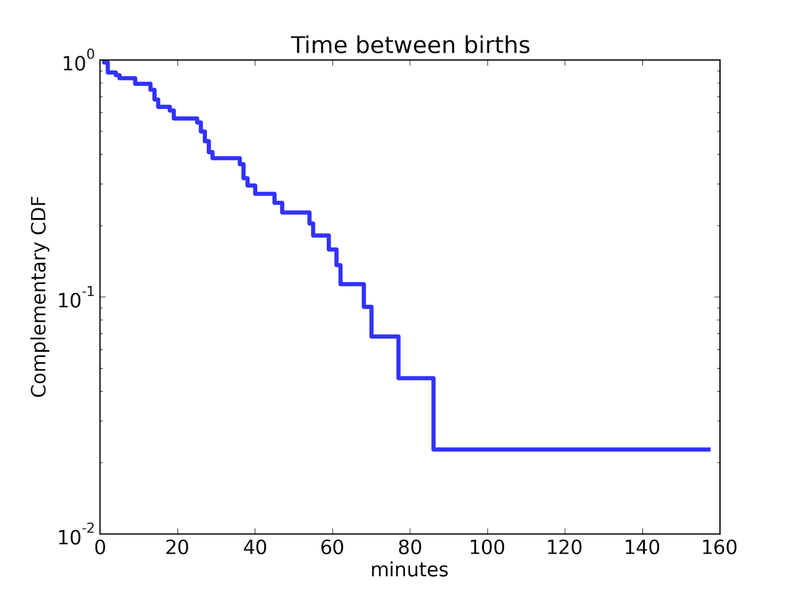 Each possible arrival rate yields one of the light blue lines; the dark blue line is the weighted mixture of the light blue lines. So in this scenario, you expect the next train in 5 minutes or less, with 80% confidence. Thank you for writing to let us know about the Red Line case study in your book, and thank you for your question. You’re right that the scheduled time between trains listed on the subway schedule card for rush hour is greater than what you observed at Kendall Square. It’s meant as a slightly conservative simplification of the actual frequency of trains, which varies by time throughout rush hour – to provide maximum capacity during the very peak of rush hour when ridership is normally highest – as well as by location along the Red Line during those different times, since when trains begin to leave more frequently from Alewife it takes time for that frequency to “travel” down the line. So yes it is meant to be slightly conservative for that reason. We hope this information answers your question.